My last post included a recipe and price break-down for an organic and healthy low cost meal. I compared my creation with a meal from Jack-in-the-Box. For details, please check here. I’m experimenting with high-quality, organic food on a low-income budget and legumes are a perfect ingredient. Legumes are a class of vegetables that includes beans, peas and lentils. One of my favorite things about legumes is the wide range of creative colors. I’m fascinated with food traditions, culinary nutrition, creative cooking and the cultural heritage of food. This category (legumes) fits all of the above. 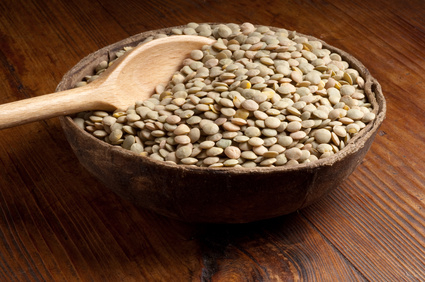 This post will focus on lentils – a short exploration and recipe. Lentils are one of the oldest cultivated legumes with seeds found at archeological sites dating back as far as 8000 years. I think they’ve survived the test of time. They’re inexpensive, nutrient-dense, power-packed with fiber and help maintain balanced blood sugar levels. Plus, they don’t need to be pre-soaked and are easy to prepare and easy to digest. These little things are user-friendly all the way around. Another thing I like about lentils is the fact that they seem to soak up the flavors of other ingredients. Heat oil in a heavy soup pot (medium-low setting). Add chopped onions and sauté for 3 to 5 minutes. Add garlic and continue cooking for another minute or so. Pour in broth, water, tomatoes and their juice, sweet potatoes and lentils. Stir well. Cover and simmer for an hour or until lentils and sweet potatoes are fully cooked. Add seasonings and cook for another 15 minutes or so until flavors are well blended. Sprinkle with shredded Parmesan cheese for a nice treat. * Rinse well and do a quick check for funky stuff (sometimes hard debris gets mixed in). * I absolutely love the smokey flavor of fire roasted tomatoes, but they also contain blackened pieces from the roasting. If that bugs you, get the regular kind. * This seasoning contains onion, black pepper, garlic, parsley, celery seed, basil, thyme, oregano, sage and coriander. Use your favorite blends. Cumin also works well with lentils. You can make several meals out of this and it seems to get better each day. If it becomes too thick, add more water or broth when you reheat it. You can also toss in some chopped greens on day 2 or 3 to change things up. Finely chopped spinach or kale works great. That’s about $1 or less per serving and everything I used was organic and nutrient dense. It can be done! Check this out. 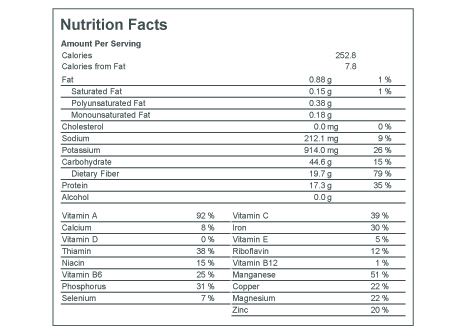 I took the time to calculate and break this down into nutrition facts. It’s not a perfect evaluation because I wasn’t able to factor in the potential difference between regular and organic foods, but this is an approximation of what you’re getting with 1 bowl of my lentil stew. Not bad for one dollar’s worth of food. This is an example of low-cost, nutrient-dense food. And look at the fiber content. Plus, you can’t calculate what you’re not getting (pesticides, hormones and other icky things) with the use of organic food. That’s priceless! Diane at The W.H.O.L.E. Gang is hosting Friday Foodie Fix. Her secret ingredient is lentils, so head over there and check out all the recipes.